Chrono Connect 1.6 is program for collecting data from a chronograph connected by serial cable, USB-Serial adapter cable or USB ( for CED M2 ) to a PC. Chrono Connect registers and can let you save the power of projectiles being fired through your chronograph. Free to use or pay to unlock additional features. The program is free to use in its demo mode for as long as you wish however the demo mode does have some limitations that are not disabled in the full version. The Demo will not save your settings for chronograph connection. The Demo will not save your settings for pellets entered. The Demo will not save your settings for guns entered. The Demo will not keep more than 10 shots in the string. No calculator needed - works the power out for you! 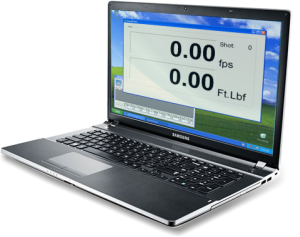 See shot string statistics instantly including average speed and power and standard deviation. Concentrate on the shooting rather than logging and maths! The demo can be unlocked providing you with a full logging program for every shot fired over your chronograph during a shooting session without writers cramp! Unlocking your copy of Chrono Connect 1.6 not only makes it easier to use but will allow you to save the full collected shot string into a CSV file for use in any spreadsheet where you can create charts, list and graphs. Once you have purchased credits you can unlock in program by clicking the Unlock button and entering a username and password you are given when you purchase. Chrono Connect is currently on version 1.6, to download click the button below. You can also download older versions of Chrono Connect if you need one for compatibility reasons. You can use our online Graph Me tool to create charts for the web and BBS systems to help show others in a nice easy format how your gun is performing, or not. When you use this feature we cache all uploaded graphs to build a picture of Pellet types used, rifles used, calibers used etc. This means you are helping in the future development of Chrono Connect.